I spent my childhood reading storybooks about places where the snow never melts and where huge beasts rule the land. Narnia’s centaurs and talking foxes filled my days with magic, but they existed firmly between the ends of these books. It was hard to imagine these creatures inhabiting the same world as our suburban lap dogs and chubby squirrels. And yet high speed internet arrived and I discovered David Attenborough’s Planet Earth series. I watched it over and over again, thrilled to realize that otherworldly places and extraordinary creatures do exist. One of these places was Alaska. 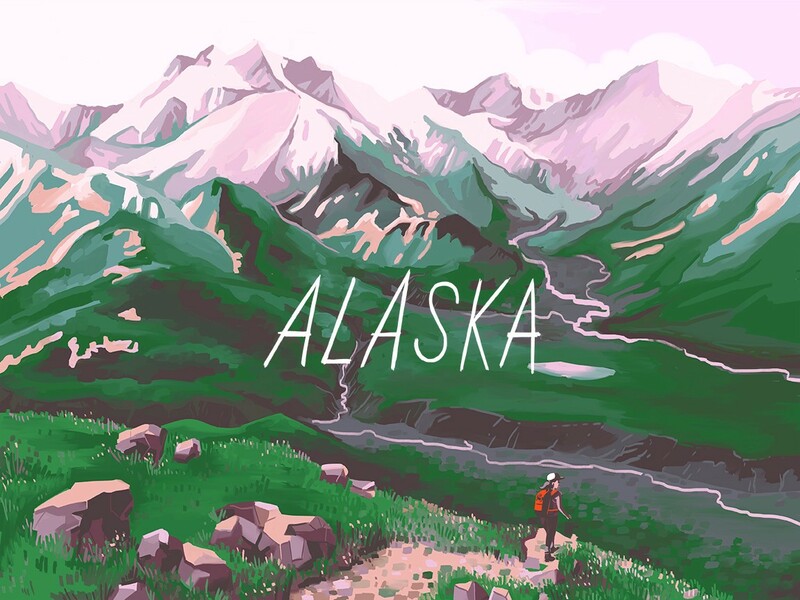 Alaska is home to glaciers the size of Rhode Island, some of the largest bears in the world, and a mountain that reaches almost 4 miles high. I read these facts and scrolled through countless pictures on my shiny laptop screen, but it was plain that there was no way to comprehend the magnitude of the Alaskan wilderness without standing there in person. So last summer, my family and I went to Alaska in the hopes of seeing this fantastically large and untouched landscape with our own eyes. Arriving in Alaska felt like I was about to step foot into a storybook. We started our trip on the Gulf of Alaska with Prince William Sound, a popular spot for glacier cruising. 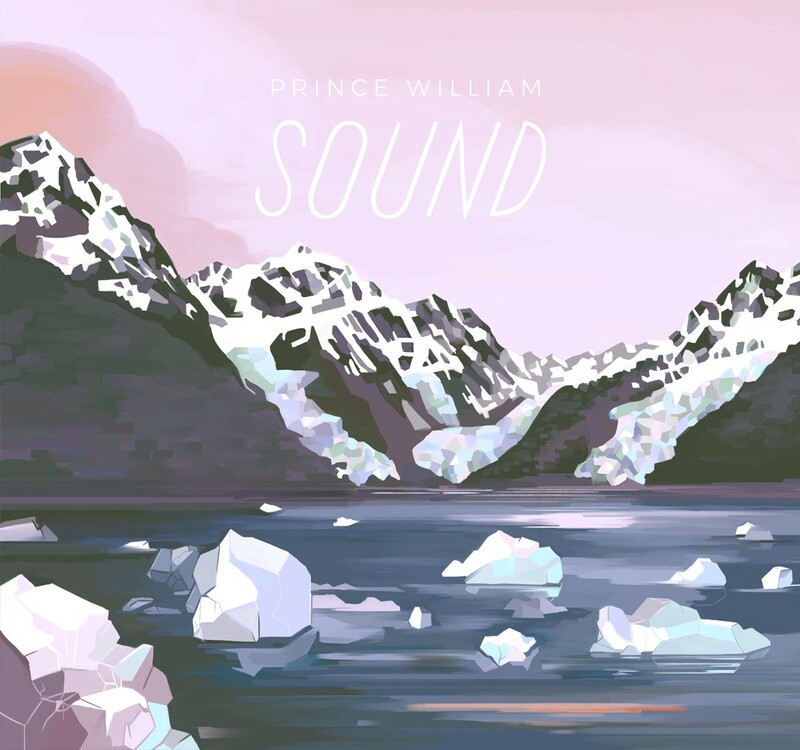 Prince William Sound covers thousands of miles of the Alaskan coastline, and is home to dozens of glaciers nestled between fjords and mountains. Nowhere in the world is there a denser concentration of tidewater glaciers. The glaciers were huge. It was hard to grasp the scale of these walls of ice until we saw tidewater glaciers “calving”, or breaking off into the sea. As these ice floes drifted toward our boat, we realized that some were are big as a car! One tourist spotted a bald eagle resting on an ice floe. “It doesn’t get any more American than that, folks,” said the captain. 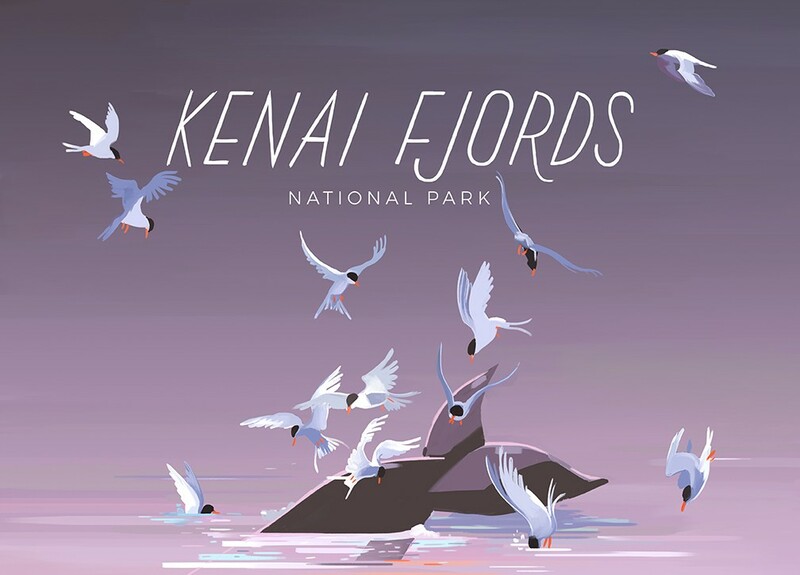 If touring Prince William Sound is about viewing glaciers, then visiting neighboring Kenai Fjords is about seeing marine wildlife. For this day trip, we boarded a small boat run by the National Park Service, which was more maneuverable and quiet than the cruise ships commonly used for Prince William Sound. Some animals were easy to spot: cormorants stood stiffly on rocks, drying their wings in their awkward way. Tiny puffins whizzed over our heads and into rock crevices. Sea otters drifted close to our boat, some close enough for us to see a little sea otter baby! But the biggest prize was the humpback whale. We soon learned that flocks of opportunistic little white seabirds hovering over water indicated whales below. The surfacing whales would disrupt fish, bringing a lovely lunch up to the water’s surface for both the birds and whales. Our nimble boat chased these birds all day on behalf of its camera-happy passengers. The captain would announce that he’d spotted a flock, swiftly point the boat in its direction, and silence the motor. If the boat was quiet and still enough, the whales wouldn’t notice us, and they would breach right there! A few days later and a couple hundred miles north, we were stretching our legs in the vast expanse of Denali National Park. In an effort to keep Denali wild, the park is intentionally undeveloped and private vehicles are restricted to a small area at the entrance. One lone 92-mile dirt road provides access into the park and is the lifeline of Denali. While Denali provides normal tour buses, it’s the green transit buses that are unique to the park. These buses are like a circulator designed for hitchhikers. Patrons can see the vast park from inside the vehicle by riding the bus endlessly. Or they could ask to be dropped off at any random point on the road. There, they would venture out to do their hiking of choice, whether it’s for one hour or one month. To return, they would hike back to any spot along the road to flag a bus. The next green bus to pass by would be their ride back to the entrance. We chose to get off and follow a river out onto the sub-arctic tundra. I’ve never walked on anything as spongy and brittle as tundra. 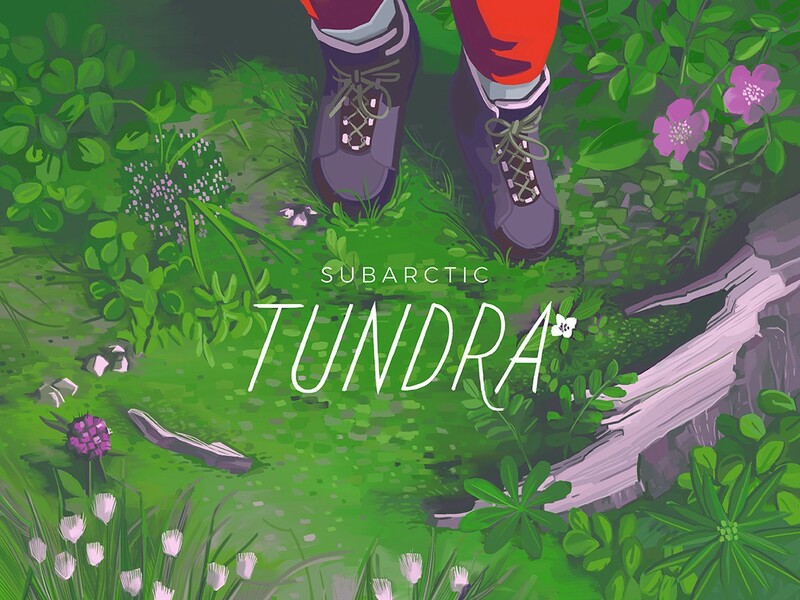 Sub-arctic tundra is a biome of low-growing grasses, sedges, and flowers. These plants are so fragile that rangers recommend you don’t follow in the footsteps of your hiking party. The delicate ecosystem doesn’t take much more than a few footprints to give way and become a dirt path. We had gleefully sought out marine wildlife on the ocean. But here on land, we were hoping to avoid any encounters. The animals in Denali are no joke. Lumbering grizzlies can weigh as much as 600 pounds, and an angry moose is arguably just as scary. Without the protection of a boat or bus, we were definitely lower down on the food chain. I felt like a fat marmot holding a tiny can of bear spray as my only defense. Hiking onto the tundra meant a lot of scanning the landscape and hollering “Hey bear!” around corners. We memorized the bear drill, which happens to feel as counterintuitive as possible. It goes like this: Don’t run. Instead, stand still. Wait until the bear moves away to slowly back off. If a black bear comes up to you, fight back. If a grizzly comes up to you, play dead until it really attacks you, and then you punch back. Luckily, there was no bear punching while we were in Denali. 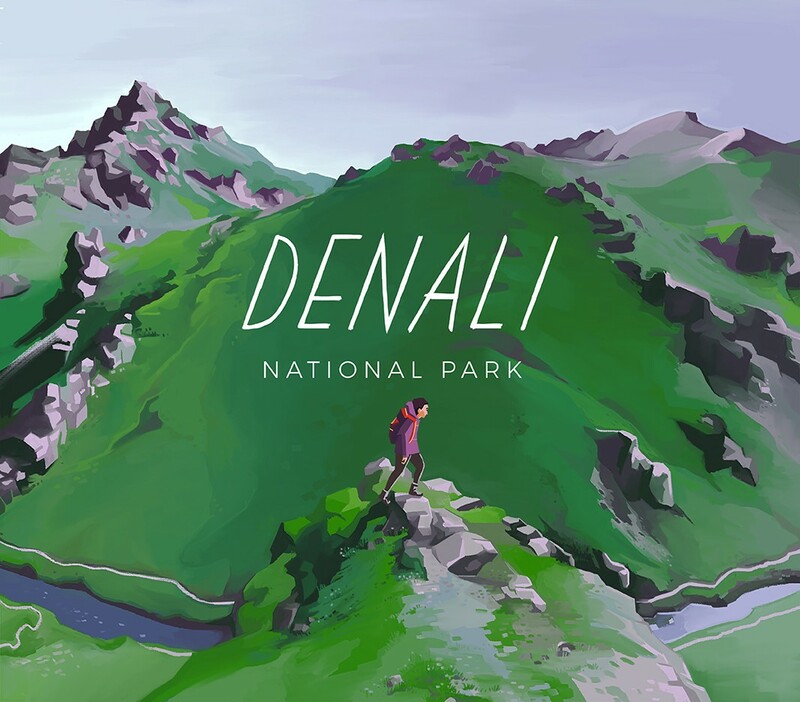 Denali has an informal 30% club, referring to the small percentage of tourists that actually see Mt. Denali through the cloud and fog. We were hoping to get lucky and catch a glimpse of the tallest mountain in North America, but I was a little skeptical as I peered at the horizon. The Alaskan mountain range was already so grand and spectacular. 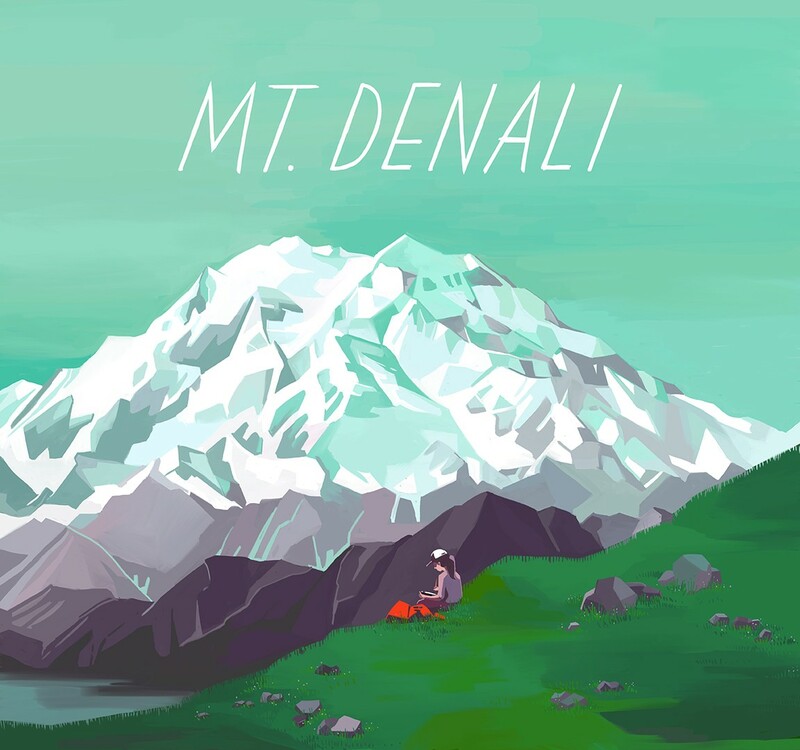 How tall would Denali actually look? When it finally emerged over the road, Mt. Denali clearly dwarfed all the landforms around it. The mountain was so completely covered in snow that it looked like a glowing daytime moon. High ridges were a bright, luminous white under the sun, while shadowy crevices sank into deep blues and purples. Only towards the bottom third of the mountain were there any earthly brown hues. This gorgeous sight made it easy to understand the strong draw this peak has on mountain climbers. Maybe that could be a dream for another time! But for this trip, we went home happy and satisfied to dream of breaching humpback whales, lumbering grizzly bears, calving glaciers and walking on spongy tundra. Alaska was every bit as wild and magical as I had imagined. 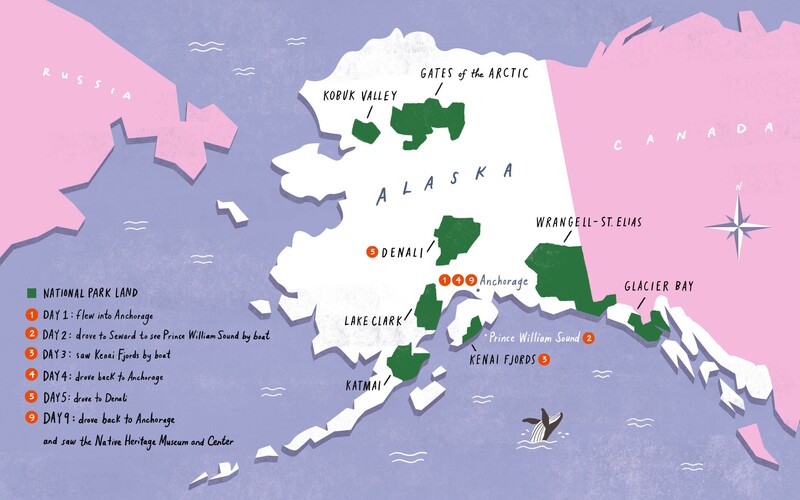 We spent 10 days in Alaska, renting a car from Anchorage and driving south to Kenai Fjords before stopping again in Anchorage and heading north to Denali. Our mid-June visit was an ideal time to visit, as the weather was warm and the skies clear, with the exception of 1–2 rainy days!